Drone use for aerial view, photography and cinematography is on a big upward trend. More importantly there is a business opportunity for owners of the best quality drones and camera equipment to be hired for specialized work. Using drones or renting drones along with professional pilots and photographers is a new sector with plenty of growth potential. Over the next few years we will see drones been used in new areas of the economy. There is big potential for companies to use top quality drones and camera equipment for site surveys, property management, advertisement and promotion. There is also a huge demand for drones to be used in situations which traditionally used expensive helicopters rental. In this drone review we take a serious look at 4 of the best drones on the market today. With top quality camera equipment you will produce impressive aerial photography and cinematography. Below we have 4 top drones from different drone companies. These drones are expensive but they are the best for aerial imagery. Adding top of the range gimbals to stabilize the camera equipment along with a top quality camera, you are looking at prices from 2,500 to 40,000 USD. Having the best equipment is an investment which pays off with top quality imagery which clients always want. The DJI Spreading Wings S1000+ has been specially designed for professional aerial view, photography and cinematography. It comes with retractable landing gear, as well as folding frame arms and propellers to minimize storage space. Every detail has been designed with the needs of creators in mind, while its light weight offers them a longer flight time. This drone allows you to carry heavy DSLR cameras such as the 5D Mark III with the advanced eight-rotor propulsion system. The S1000+’s arms and landing gear are made of sturdy carbon fiber, giving remarkable stability and strength. You can fly in a variety of weather conditions with confidence, knowing your gear is safe. 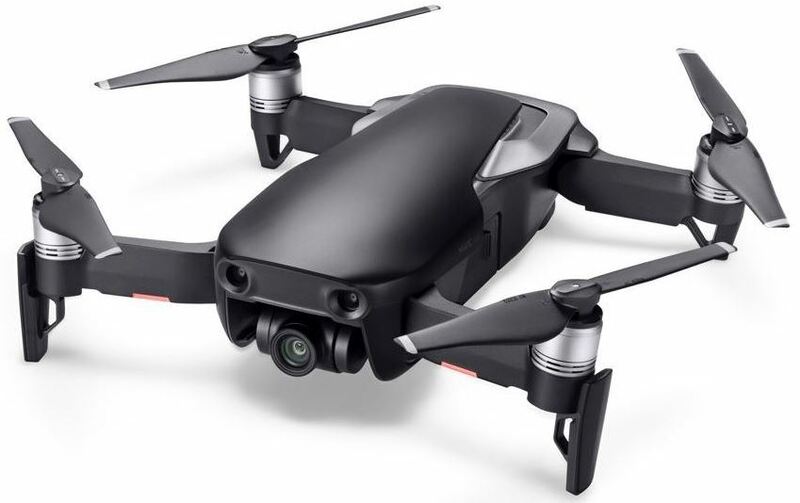 The advanced eight-rotor propulsion system of the DJI Spreading Wings S1000 has arms and landing gear which are made of sturdy carbon fiber, giving remarkable stability and strength. With arms that fold in to save space, the S1000+ is built to be taken wherever you need to go. Then when you want to fly, you are ready to start shooting in just a few minutes. It is ready to fly in 5 minutes. The S1000+’s gimbal bracket is separated from the main frame by specifically designed dampers. This significantly reduces high-frequency vibrations and will make your photos or filming clearer and sharper. 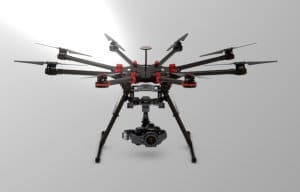 The retractable landing gear on the DJI S1000+ and a low gimbal mounting bracket allow for a wide range of photography angles and camera cinematography motions. The upper center board of the DJI S1000+ can be removed, giving access to the IMU. In here, there are eight positions reserved for your extra equipment. So installation of your main controller, iOSD, DJI Lightbridge, or any other accessories is faster and easier than ever before. This new center board structure is perfectly compatible with the DJI WKM and A2 flight controllers. Redesigned, rebuilt power distribution system improves safety and reliability. Gold-plated metal bearings with a unique screw design secure the power cords, ensuring cables will not come loose during flight and allowing easy setup. A 40A electronic speed controller (ESC), our fastest available, is built in to each arm. The 4114 pro motors, high performance 1552 folding propellers, and V-type mixer design combine to give each arm of the DJI S1000+ a maximum thrust of 2.5 Kg. This latest motor adopts a single wire stator design, offering improved heat dissipation, better performance, and a tidier, more reliable system. DJI Spreading Wings S1000+ speed range in the 30 to 45 mph. 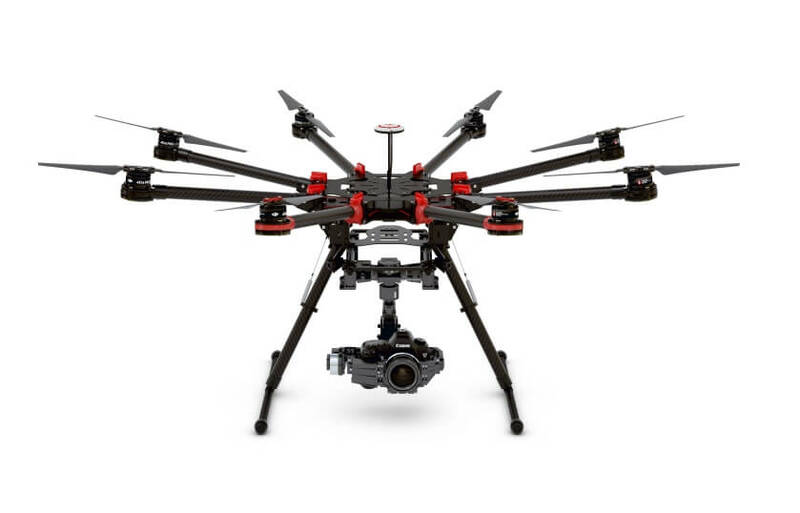 Weighing just 4.4kg, the DJI S1000+ has a maximum takeoff weight of 11kg. This means you can easily carry most top of the range cameras and gimbals, including the Zenumse 5D Mark III gimbal. Depending on the location ¾ of a mile to 2 miles. The below prices are at the time of writing this post. If you are looking at owning a drone with a view to making a business where clients will pay you for taking great aerial photos and film, then it is well worth having the best gimbal to stabilize your camera and also to have a top notch camera which will produce professional imagery. I’ve only recently added the DJI Inspire 1 to this article on top business drones. DJI is expanding the use of the Inspire 1 beyond the area of aerial cinematography and photography. The Inspire 1 is perhaps the most innovative drone on the market to date. The Inspire 1 has a number of new patented design features. It has terrific flying capabilities and its stabilization is perfect. 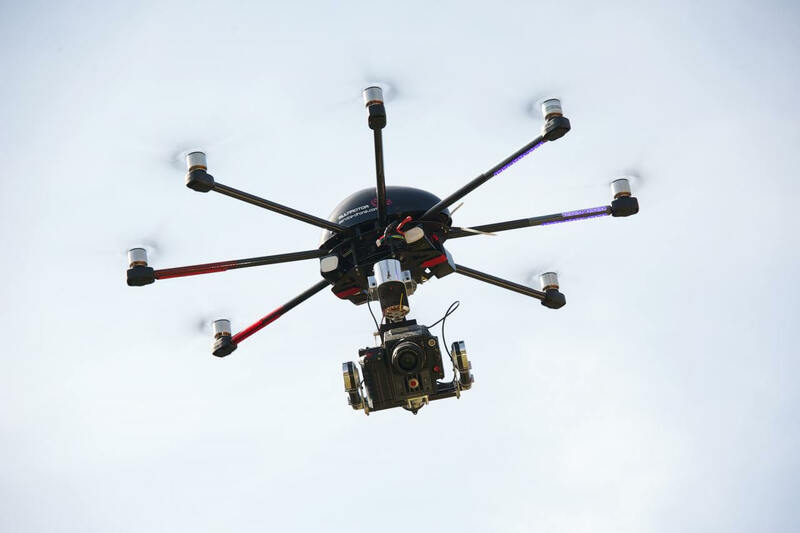 The cameras are specially designed for aerial filming and photography which makes it perfect for many sectors. The Inspire 1 now comes with multiple options for its payload. I believe this will expand even further over the next year. In December 2015, DJI released the Zenmuse XT which is an integrated gimbal / thermal imaging camera for the Inspire 1. The gimbal is from DJI who are World leaders in gimbal technology. The thermal imaging camera / sensor is from FLIR who are also World leaders in the field of sensor technologies. That certainly makes for a winning combination. It is probably why DJI are so far ahead of the competition. Now, when it comes to the Inspire 1, whichever option you purchase, you have a UAV which is practically ready to fly straight out of the box. You don’t need to mix and match gimbals and cameras etc. Here is the full Inspire 1 review. There are so many industries already using the Inspire 1 without any regrets. Introducing this stunningly beautiful Draganflyer X4-ES quadcopter. The Draganflyer X4-ES UAV is a professional quality, powerful, easy to fly aerial quadcopter designed for commercial/industrial aerial cinematography and photography. The carbon fiber helicopter folds for easy transport and is quick to deploy for an emergency situation or the aerial photographer on a short timeline. The Canopy on the DraganFlyer X4-ES can be customized to add your company name or logo. Draganfly drones are 100% designed by their team including all hardware, electronic systems design, and software. And it doesn’t stop there. The systems are handmade in North America and each system is burned in, calibrated, and flight tested before packing and shipping. The value of being an original manufacturer is that they have control over the product quality, the writing of every line of software code, and their technical team is intimately familiar with the systems allowing them to consistently provide high quality systems and professional systems support. Search and Rescue: The first time a UAV had been used to save a life was this past May. The X4-ES was deployed with an infrared camera, finding an injured individual in a matter 20 minutes. This was after both a ground search team and a full sized helicopter with night vision goggles failed to find anything. Traffic Collision Reconstruction: The X4-ES is presently being used multiple times a week by local police in accident investigations. 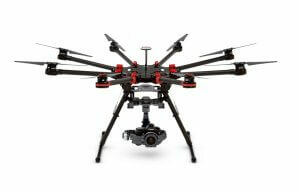 The X4-ES helicopter system delivers a high quality digital video from a wide variety of cameras. When flying a digital IP camera payload, the system is delivering 5mp live video providing razor sharp real-time video. It can deliver this quality because the camera gimbal is gyro stabilized in the pitch and roll axis. The camera is vibration isolated and the video data is delivered through a dedicated digital communications channel. This combination helps keep the camera on target and provides highly detailed results. Space saving design for convenient transportation. Size matters, so the Draganflyer X4-ES packs up small, but retains the ability to be quickly assembled, set-up, and deployed. Draganfly understand the design of an excellent UAV package goes well beyond the drone. Designed for critical, real-time missions. The extremely portable and ergonomic handheld ground control station provides you with a direct sunlight viewable screen for real-time video, telemetry, and mapping. Controlled by our powerful Draganview software, safety features such as audible alerts and automated return-to-home, either at the touch of a button or when communication is lost, provide an extra level of protection. On the fly switching between color and thermal FLIR imaging. The Draganfly dual payload system features a brushless 2-axis stabilized mount housing two camera systems that function as one. During the same mission you can view and capture high resolution still images and/or at anytime switch the video down-link feed to the FLIR camera system. All the while, the FLIR subsystem is recording video to the on-board micro DVR. Two camera subsystems, which to the user, appear to function as one. That’s powerful imaging from Draganfly Innovations. Change your powerful payload options in seconds. The Draganfly 1/4 turn Quick Release (QR) payload is clean, simple, fast, and even better, it eliminates the need for messy cables between the payload and helicopter. The benefit: it is very fast to swap payloads and there are no worries about missing a critical connection. Clean, quick and professional. Safe takeoffs and landings with the benefit of portability. Patent-Pending, folding landing struts combined with the patented folding frame and patent-pending quick release prop system provides a very compact and quick to deploy drone system. Constructed from high quality carbon fiber, the landing struts provide a solid, strong, wide stance, to help protect your investment and reduce the risk of “tip overs” when landing in strong winds or rugged terrain. When it is time to pack-up from the scene, packing the system is a snap. Safe, durable and long–lasting. The battery is the magic behind high quality small unmanned systems and at Draganfly Innovations they take this very seriously. With the push of a button, they quickly pre-flight the battery and the DragonFly in-house design circuitry is consistently balancing the cells providing under-voltage, over-voltage and short–circuit protection. Protect your investment; take your system anywhere anytime. Every Draganflyer X4 ES system comes standard with a custom designed military grade transport case for ultra- portability. CNC foam cut-outs provide a safe and convenient place for every component. Lighter soft bags are also available upon request. The patented unique folding frame means the helicopter can be easily transported and ready to fly in a short period of time. Packing into even tighter spaces the landing gear and payload are easily removed so incredibly it’s only 16cm (6.25″) wide when folded. Flying weight including the flight battery, gyro stabilized camera mount and the SONY RX100 camera is an amazing light weight of only 5 pounds. Draganfly has gone to great lengths to design and manufacture a strong, light weight solution, that delivers amazing results proven to save lives. High quality custom made components are used throughout the aircraft. For example custom flared carbon fiber booms and motor pods are molded as one piece creating not only an attractive, but incredibly strong airframe. Folding carbon fiber landing gear, carbon fiber props are custom engineered and molded to exacting specifications to control weight, performance and overall quality of the aircraft. At the time of writing this article, the price for the base model of the Draganflyer X4-Es was USD 24,995 which also included the brushless stabilized camera mount with Sony RX100 III Digital Still/Video Camera. There are many different ways to configure any drone with gimbals and cameras. My best advice would be to work with the staff at DraganFly, give them your requirements and let them come up with the best drone configuration for your needs. 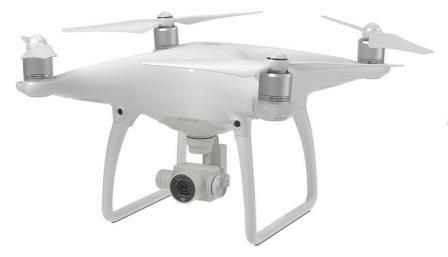 This is probably the top drone for any situation for aerial photography and cinematography. If you’ve every dreamed of having the perfect drone, then this is probably it. Regardless of the flight position, the speed and the weather conditions (except in case of rain), the Multirotor G4 7.8 Brushless Skycrane combines all innovations which enables images and video images of spectacular quality. If you have seen these best sports drone videos, both the Motocross and the Portugal Car Rally videos use the Multirotor G4 7.8 Skycrane. In the Portugal Car Rally, the canopy of the drone is the German car company Volkswagen. You can view the tremendous quality of the Multirotor on the Service-Drone videos web page. The quality is just unbelievable. The Multirotor Skycrane is manufactured by Service-Drone and with this you get the “Made In Germany” quality. Service-Drone are not just a manufacturer of drones. They have business opportunities where you can become a Licensed Partner or even a Service-Drone Distributor. They offer a fantastic opportunity, as the services of professionals who can provide quality aerial viewing, photography and cinematography are going to be in high demand. Service-Drone have probably the best drone on the market. With the business opportunity, where they offer full training including marketing, you could have a very nice business. A business which is interesting and gets you out of the office to the great outdoor life. Technical range 1,000 meters min. The latest 32-bit dual-processor technology enables this drone to be probably the most secure drone flight ever with the Flight-Control system correcting the flight position 512 times per second. The redundant design of the flight electronics as well motors and accumulators provide a powerful, flexible and above all safe drone-flying. Autonomous flights on a range until 4 million square meters. Unique GPS flight assistance for manual or fully autonomous flying. With GPS, temperature sensor, pressure sensor, 3-axis angular rate, acceleration and geomagnetic sensors the drone keeps the exact location and altitude. The function ensures the autonomous return to the pilot or the starting point. Before or during the flight, you can set waypoints. Fly autonomously with planned survey flights. By a plurality of sensors, it is possible to let the Multirotor start automatically. Accurate data acquisition 128 times per second. Agisoft PhotoScan can export the following filetypes GeoTIFF, KML/KMZ, Collada, VRML,3DS, FBX, PDF, DXF, U3D, OBJ, PLY, XYZ Point Cloud, LAS. The wide variety of sensors allows a fully automatic landing and prevention in case of error. The UAV flies itself, simply take the hands off the controller and the drone holds the current position and location. The technical blocked altitude is 3.500m. The carrying capacity is 400g up to 5 kg. The flight time is 10min to 40min depending on equipment and UAV. 2 and 3-axis stabilized brushless gimbals which provide incredible camera stability. Free interfaces for future sensor technology (radar, laser, collision avoidance). Flying for everybody “out of the box”, no model flight and model build skills required. Live image transmission in real-time with VGA, SD or HD (encryption is possible). Intelligent and easy to use flight planning software (PC and iPad) for autonomous measurement, video, control or transport flights. At the time of writing the Multirotor G4 7.8 Skycrane had a price range of USD 52,400 for the base model.